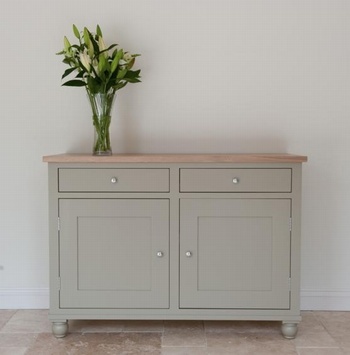 The simple but supremely elegant 4ft Suffolk Sideboard has its emphasis on pared back design and quality craftsmanship. Fabulously functional, the plain oversized door frames are hand painted in Honed Slate and coupled with a beautiful seasoned oak work top. The elegant ball foot gives a refined finish to this timeless piece.